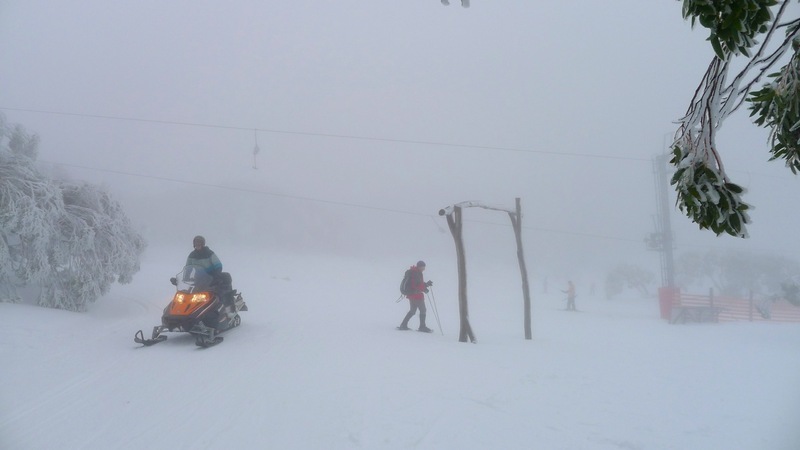 Have you ever wanted to go to the snow but haven’t, because skiing (for whatever reason; cost, long lift queues, ability, or potential injury) isn’t your thing? Forget the tennis racket image. That’s ancient history! 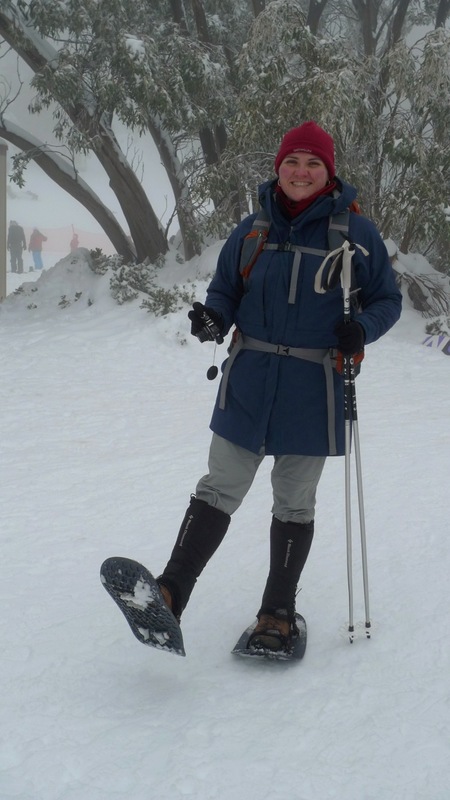 Let me tell you about our day trip to go snowshoeing at Mt Baw Baw the other Sunday. Leaving home at 8:40am was a little later than planned, but we’re pretty bad early starts at the best of times, although the aim had been to avoid arriving at the same time as everyone else. Last time (2 year ago) we took the route via Seville. If you’ve got the time, and it’s not out of your way, it is a nice drive although it’s a little bit longer. This time we took the highway to Druin before turning north. 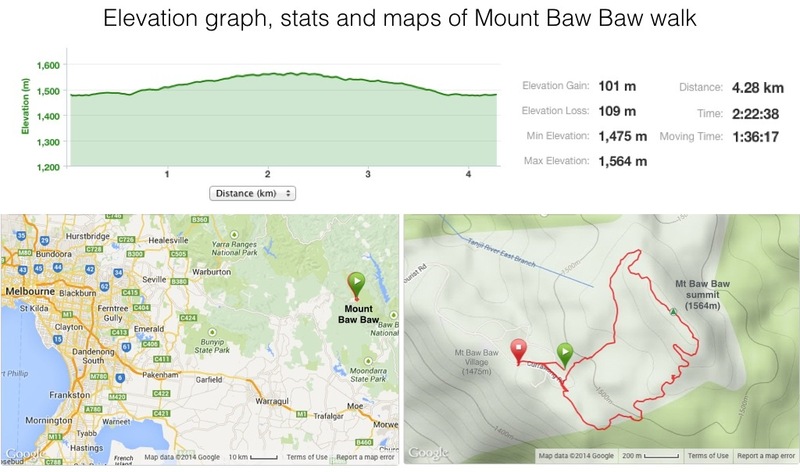 It’s pretty easy to follow the signs to Mt Baw Baw from there. The roads get pretty windy from Noojee and there are plenty of potholes to avoid too (so you won’t miss out, even if you haven’t chosen the Seville option), keeping the driver alert behind the wheel. We got to the turn off to Baw Baw Alpine Village from South Face Road at around 11:00, and saw the first snow on ground – that hadn’t just fallen off cars driving down the road. Unexpectedly everyone was being asked to put chains on. We weren’t sure why because the road was clear… So much for keeping our chains in pristine condition, then! There were staff helping people who had ‘forgotten’ how to put chains on their cars. The main thing you need to know is whether your car is front or rear wheel drive – and if you don’t, someone else there is bound to be able to tell you. Arriving at the carpark we saw why we needed chains. There was snow and slush. Some of it was white, but it was getting browner by the minute as the convoy of cars drove in. Stephen lifted the windscreen wipers (in case it snowed while we were gone) and we donned our hiking boots, gaiters, beanies, gortex jackets and gloves, shouldered our backpacks (valuables, spare clothes, water and lunch) and joined the line of people making their way up to the village where the fun starts. Now this is how to get around the village! There was a shuttle bus (mini van) option if you didn’t want to walk up to the village, but it wasn’t a long walk to where we needed to buy a day pass (Carpark 1). We didn’t do it online before arriving because it wasn’t cheaper, I but think we might next time – not because of a queue, but because you’ve now got to create an account. This will supposedly make it faster next time as I log in using just my mobile number and a 4 digit pin I chose (which can be SMS’d to be if I forget it by next time), but we’ll see how that goes… Note though, that if you want to make payment (cash or eftpos) to a person at the resort office, it costs $5 extra. Oh, and you’ll need to know your car’s registration number, so if you’re coming in a hired car your options of paying in advance may be limited. Just past the village entrance, we found a jolly, and very realistic looking Santa on the way to the ski hire shop (Christmas in July is big here in the southern states) so took the opportunity for a photo. Happily we didn’t have to wait long to pay for equipment hire. On the form you complete that details what you’re hiring out, it’s pretty telling that snowshoes aren’t listed as an option to tick. Come to that, they’re not prominently advertised on the website, either. The girl at the counter just wrote ‘snowshoes’ across the columns on both rows. Second clue was the blank look I got when I went to the counter to collect them. Fortunately the cashier girl was able to point the counter girl in the right direction and hey presto – two pairs of snowshoes! Lastly; stocks. 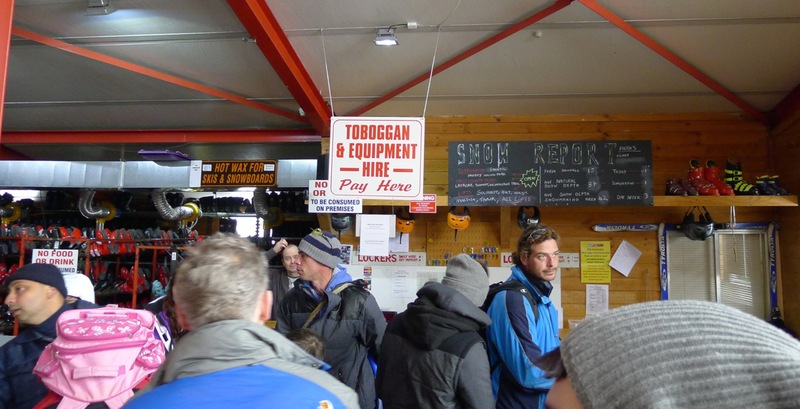 As these are collected from a different counter – where skis and boards are dispensed – we had to wait a while as staff adjusted boot fittings and things for snowboarders. Snowshoes and stocks finally in hand we ventured forth! Now, please be considerate and don’t put them on as soon as you exit the building – there’s not that much room just outside the door! Stephen insisted on being so considerate we walked half way down the main street toward the end of the runs to find somewhere convenient and out of the way to put our snowshoes on. At Baw Baw they rent out Yowies. 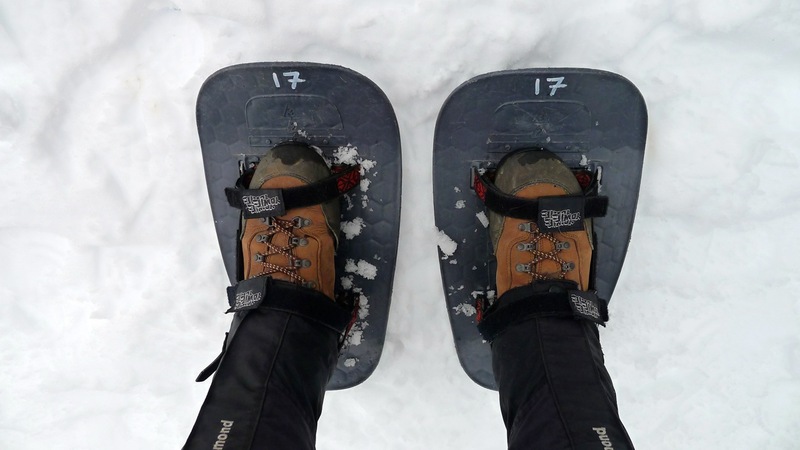 Not our preferred type of snowshoe, but since we haven’t bought our own yet, beggars can’t be choosers. My suggestion is to undo all the straps (not hard since they’re velcro), place your foot in so all the straps will strap back up (if you have larger feet, you may appreciate what I mean), then strap your foot in as tightly as possible. When you’ve got both on, have a few test strides and see if they feel like they need adjusting. You don’t want your boots to slip out as you’re hiking. I think my boot is a size 43 US (or 12 AUS), and I was glad that it wasn’t much bigger, as I wouldn’t have liked the middle strap that passed over my boot and gaiter to be any shorter. I don’t know if they have larger Yowies at Mt Baw Baw – they are only made in two sizes as it is. 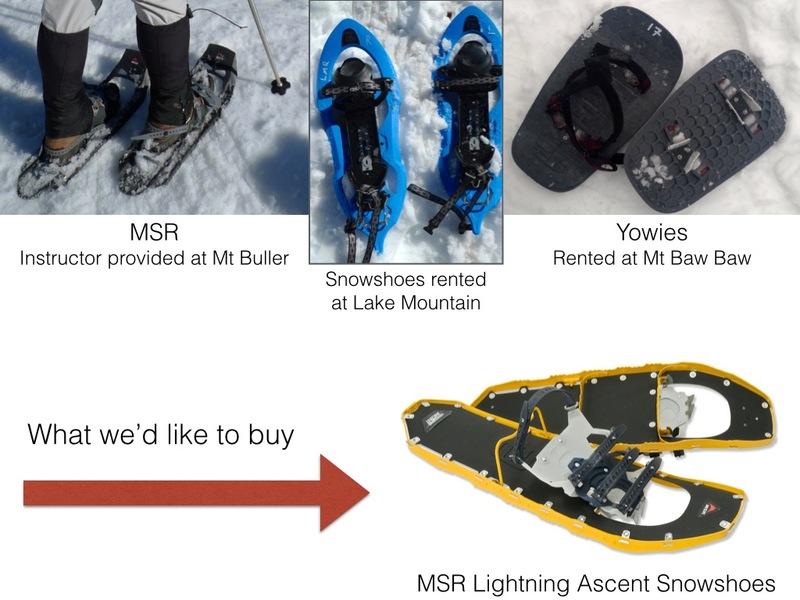 Given a choice, I’d be wearing MSR snowshoes. They’re more streamlined and have more teeth for breaking through and holding you on ice. Heading off, we drew a couple of amused (or bemused) looks from people who evidentially haven’t tried this form of freedom for themselves. A couple of cross-country trails start at the end of the main runs and where the kids learning slope is. That’s also where we found the huskies! I’d seen a sign on the main street advertising husky sled rides – and here they were! There wasn’t much action happening with the dogs at present, so we headed off. We’d decided to follow the Summit Trail today as we didn’t have time for the longer Village Trail circuit. It was pretty quiet on the track. Most people were downhill skiing or snowboarding. In fact, I think we only saw about half a dozen people on the trail all day – and 4 or 5 of them were in one family! I LOVE these fantastic colours! I’m not sure if it’s because I’m from Queensland or not, but I find the snow absolutely fascinating! So beautiful, so white, so enticing… And snow gums (Eucalyptus pauciflora) are just amazing with their beautifully coloured bark. That’s why we chose Mt Baw Baw over Lake Mountain – yes it’s a bit further to drive, but it’s higher (= more snow) and the trees are alive! (A lot of Lake Mountain was burnt in the King Lake-Marysville fires in 2009). The only downside to snowshoeing is the noise. You mightn’t think it, but walking over snow makes a fair bit of sound. The shoes on the snow, the stocks through the snow, your shoes against the straps (more so on MSR than Yowies, I admit). You really notice the difference when you pause to take a photo (or catch your breath)! In one of these pauses we noticed some tiny birds picking over the frozen leaves and around the bark of the trees. It’s tricky to photograph birds that move so quickly. I am pretty certain they are Striated Thornbills (Acanthiza lineata). We planned to stop for lunch at some picnic tables close to the summit, known as Downey’s picnic area. 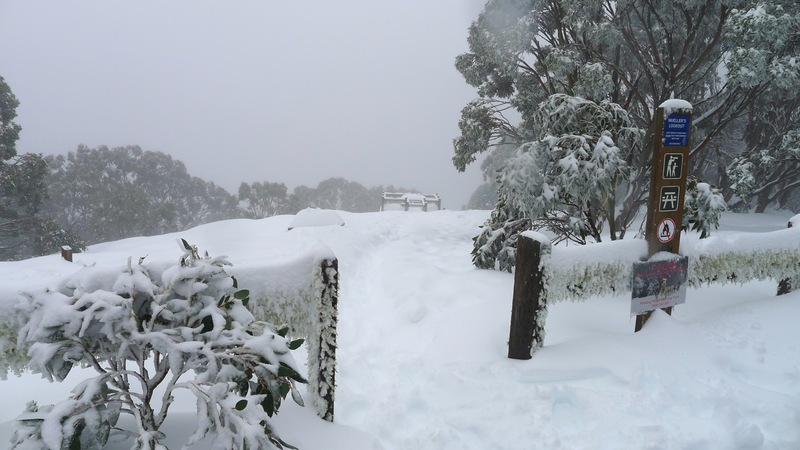 Two years ago, we did this walk in August when Australia was having a decent, if somewhat delayed snow season. This year’s snow season is on time and even better! So there wasn’t much choice but to eat standing up. We didn’t want to disturb the perfect mounds of snow on the tables. It was also a good chance to get some Bigfoot – or more accurately in this case, Yowie – footprint photos. Lunch over, we continued up to the summit where Baron Ferdinand von Mueller’s “The Cairn”, built as a survey reference point, is there to admire. Von Mueller was Government Botanist of Victoria in 1853 and later appointed director of Melbourne’s Royal Botanic Gardens, but his work was also recognised and honoured nationally and internationally. It is believed he was the first European to climb Mt Baw Baw. The picnic table at the summit is even more well burried! A little further on is Mueller’s lookout. On a winter’s day, you mightn’t get to see very far. 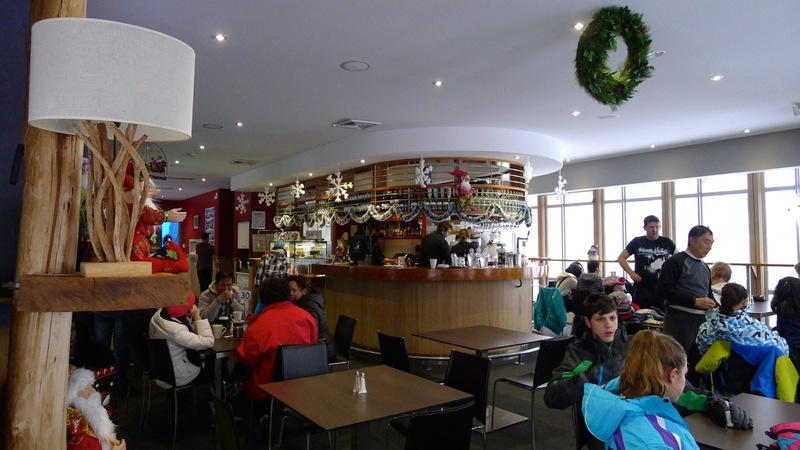 We haven’t been in summer, but Mount Baw Baw Alpine Resort’s website shows the view in summer is quite nice. From the summit, the ice on the trees started to get a bit… wild. 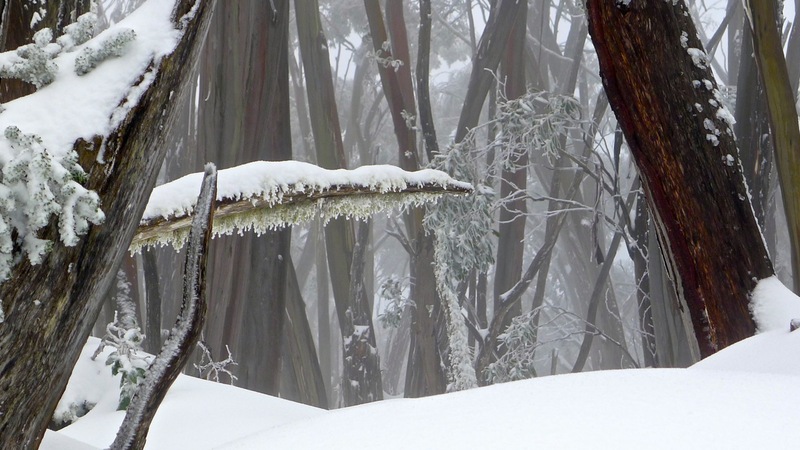 Not content with just settling as snow on horizontal surfaces then icing up, the snow gums on this side of the summit have their hackles up, and fins on. Yep, they’ve gone feral. As the trail drops down from the summit, the forest relaxes once more and it’s an easy downhill walk along the cross-country ski trail. If you walk the Summit Trail in an anti-clockwise direction as we did, you’ll come to an area called ‘The Five Ways’ where the Summit Trail ends and you have two choices – Muellers Track (walkers only) or Village Trail – that will take you back to the village. Last time we chose Muellers Track, skirting all of the ski runs to the north, and certainly appreciated why it was a walkers only trail. This time, for something different, we thought we’d try the Village Trail that- as far as we could make out on the map – slips down between ski runs and finished back at our starting point. We were passed by a snow patrol skier who only made a comment on the weather, so we were reassured that we weren’t somewhere that we shouldn’t have been, but the path down wasn’t clear to us. I was really glad when we made it to the bottom and out of the way of skiers and snowboarders. We chose snowshoeing to avoid injury, after all! Since we were back at the start we decided to have another look at the huskies. It just so happened that a team was being harnessed up for a run! And yes, they were all very excited about that! Huskies are ready to run! With that we were done, and a hot chocolate as the Village Restaurant seemed in order – as soon as we’d returned our snowshoes and poles. By now it was well after the lunch rush so getting a table wasn’t a problem. As it was getting late, we didn’t linger. We knew the queue of day trippers leaving the resort would be long, and it would be dark by the time we arrived home. It was a great day though! 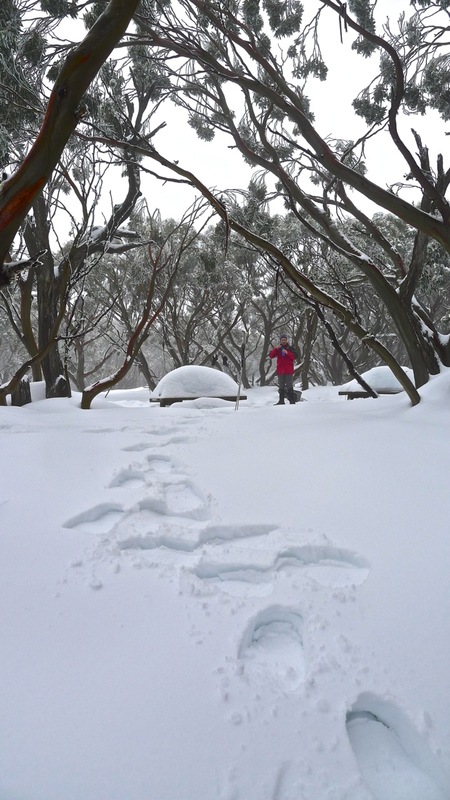 Categories: Victoria, Weekend walks | Tags: alpine, Australian Alps, Baron von Mueller, Gippsland, Huskies, MSR Snowshoes, Mt Baw Baw, Mueller's Lookout, Parks Victoria, Snow, snow gums, snowchains, Snowshoeing, Snowshoes, Striated Thornbill, Summit Cairn, Summit Trail, Victoria, Victorian Alps, winter fun, winter holiday, Yowie | Permalink.